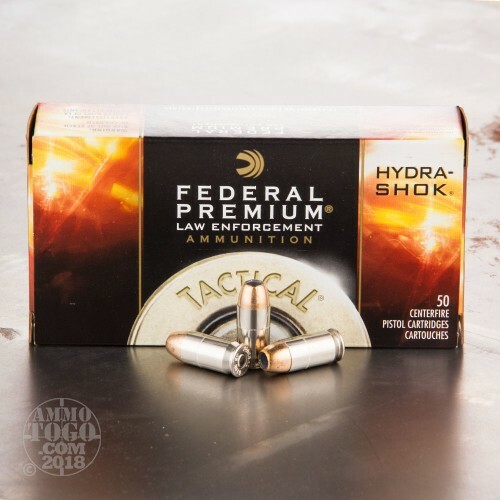 This 45 ACP cartridge from Federal’s Law Enforcement Tactical line of ammunition features the Minnesotan manufacturer’s own tried and true 230 grain Hydra-Shok projectile. This distinctive looking bullet has a center post jutting up from within its tip’s cavity, which ensures that the hollow point bullet’s ability to provide wide expansion won’t become impacted by becoming clogged up with fabric during penetration. The bullet’s hard metal jacket assures dependable penetration, and has notches to cause expansion to occur on a single axis. The Hydra-Shok excels at releasing the entirety of its energy within a soft target at an optimal depth, and it is unlikely to overpenetrate where it may cause harm to innocent bystanders. 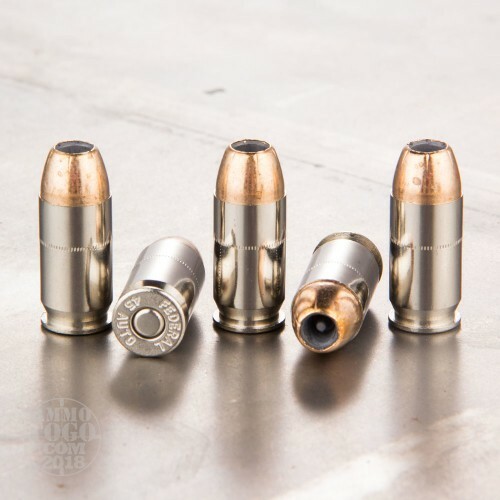 This round’s nickel plated brass casing is shiny, and thus makes it easier to check your chamber while you’re in a dark environment. That sleek nickel also facilitates smooth cycling, and helps to resist corrosion that could have compromised the cartridge’s powder. We shot five of these Federal Ammunition rounds through a four-layer cloth barrier using a Ruger SR45. The results are detailed in the video you see above as well as the photographs. Through the charts, you should get a great idea how this Federal Ammunition ammo stacked up relative to other 45 ACP (Auto) ammo products available to American shooters. 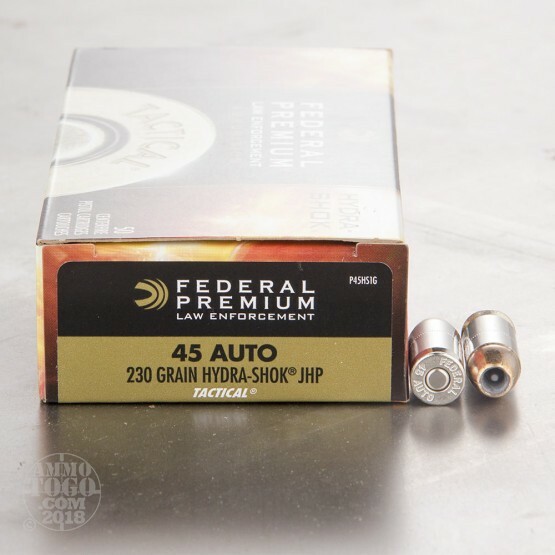 Expansion Diameter Compared to All 45 ACP (Auto) Ammo Tested MIN 0.45" MEDIAN 0.64" THIS AMMO 0.48" U.S. dime MAX 1.04"
Penetration Depth Compared to 45 ACP (Auto) Tested 0" 10" 20" 30" MIN 8.3" MEDIAN 16.7" THIS AMMO 20.7" MAX 32"